Welcome to the online home of Manosh Car Wash, the leading car wash in Lamoille county and Northern Vermont, located between Jeffersonville and Hardwick in the Morrisville Shopping Plaza. 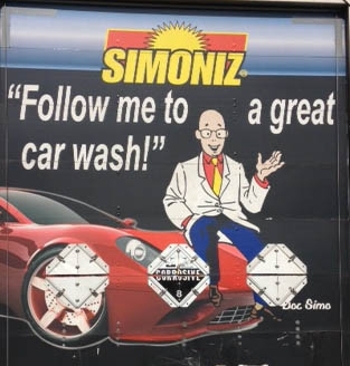 Known around the region as "the water experts," Manosh Car Wash offers you the best carwash experience using only the finest Simoniz brand products on your vehicle. Let's face it, anyone can drag the hose out and get their vehicle wet! But is that the right way? Often "driveway washing" leads to uncontrollable chemical run-off in storm water drains and pollutes our most precious resources. Dirty wash-water contains soap, detergents, gasoline, heavy metals from rust, and motor oils. Typical water usage at home is 7 gallons per minute through a standard garden hose, using upwards of 140 gallons on an average wash! Our variable-frequency drive-motors and efficient wash-cycles save not only water and electircity, but also what you desire most ... time! Our water is properly pre-treated, eliminating the hard water and corrosive compounds commonly found in tap water or ground water, thus maintaining your car's original finish. 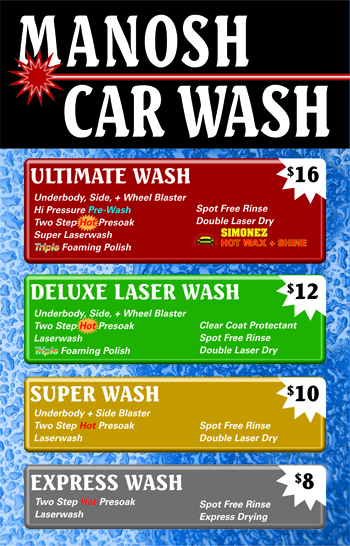 Simoniz carwash products are environmentally safe and EPA approved. Give Manosh Car Wash a try. We think you'll like it! Contact Nick with any questions or concerns. Our goal is to keep Vermont green and clean! Choose from our 3 automatic or 3 self serve bays. Visa, Mastercard, Discover, and Diner's Club gladly accepted. Our Laser Wash Autobay is Open 24 Hours, Year-Round! Doors automatically open and close with carwash activation. *Please note the vacuum shampoo units only work during the spring and summer months. Like us on Facebook to receive notification of when the shampooers are open for the season.